Twitter has been suspending or freezing accounts belonging to real people, the AP reports. Some of the accounts have been flagged for their frequency in which they’re used. For instance, an account belonging to 70-year-old grandmother Nina Tomasieski who tweets for 14 hours a day has been shut down multiple times, according to the AP. In an effort to shut down automated accounts on its platform, Twitter has suspended or frozen the accounts belonging to real people whose behaviour mimics that of bots. One such account that’s been repeatedly flagged belongs to Nina Tomasieski, a 70-year-old grandmother who tweets as many as 1,000 times a day in support of President Donald Trump, reports Associated Press reporter Sara Burnett. 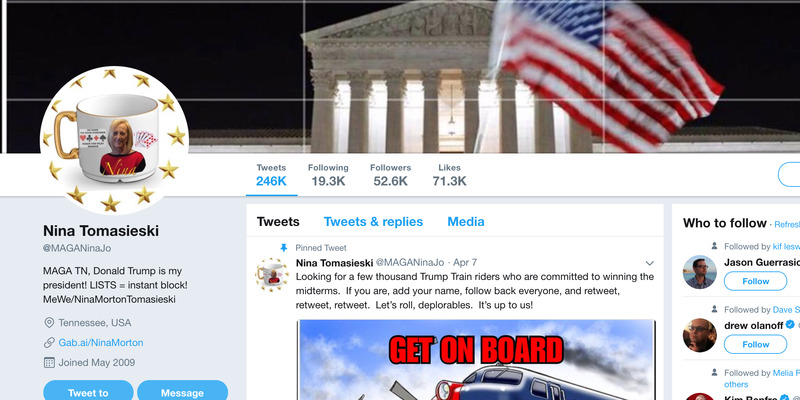 Tomasieski, who has amassed more than 50,000 followers since she joined Twitter under the handle @MAGANinaJo in 2009, told the AP that her agenda is simple: She hopes to lend her support to President’s Trump’s political campaign. For Tomasieski, this means sending out a perpetual stream of content on Twitter, including retweeting the president, clips from Fox News, and quotes from the Bible. Tomasieski told the AP that her account has been suspended or frozen multiple times, and that, as far as Twitter is concerned, she’s considered a bot. Twitter’s treatment of accounts supporting Donald Trump faced scrutiny last month when it was reported that the site was demoting accounts belong to prominent Republicans. Read the full story over at the AP here.